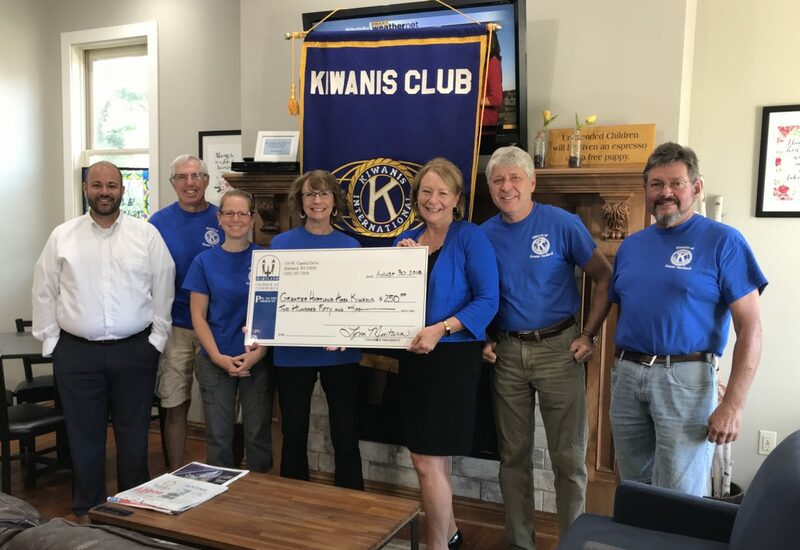 The Hartland Chamber of Commerce recently presented a donation check to the Kiwanis Club of Hartland, with thanks for all that the Kiwanis organization does for our community. Pictured (l-r) are Chamber Board Member Joe Glomski, First Bank Financial Centre (FBFC); Kiwanis members Mike Mulrooney, Arrowhead High School; Rebecca Rebholz, The Chiropractors; Suzanne Thomas, First Bank Financial Centre (FBFC); Chamber Board member, Cindy Bong, Global Financial Group: Kiwanis Members Dr. Jim Muenzenberger, Generations Dentaland Chip Schneeberger, All State Heating and Air Conditioning. Kiwanis members not pictured: Dave Cox, Village of Hartland, WI,Village Administrator; Nina Gaydos-Fedak, TTP Performing Arts Academy & MindFul Movement; Dr. Joshua Fritz, Lake Country Chiropractic; and Kelli Yogerst, Village of Hartland, WI, Hartland Recreation Director. The Kiwanis Club of Greater Hartland Area was established in 1987. They are a Service Club whose primary focus is local projects for the Hartland community and the children of our community. Sponsor of the Youth Area in the Hartland Library and a contributor to the Story Walk Project. The Kiwanis Club of Greater Hartland is always looking for new members to help them to continue contributing to the Hartland Community. They are looking for people who take pride in their community and its children. Here is a chance to add joy to your life by helping your community and shaping the Kiwanis Club for the future. For more information on how to make a difference and have fun doing it, contact the Kiwanis at kiwanishartland@gmail.com! Membership Dues are very reasonable. Look for the Kiwanis Club of Hartland on Face Book.